Beautifully soft and cozy, the SLPR Home Collection Faux Sheepskin Rug adds warmth, comfort and a stylish touch to a home or cabin. Soft and luxurious beneath your feet, this is the ideal rug to have beside your bed. Made of 100% acrylic, this lovely rug is warm and cozy in colder months and cool to the touch in the summer. It adds an inviting touch to any home. Available in neutral shades of White, Black, Grey and Camel. GORGEOUS RUG OFFERS MULTIPLE DECORATING OPTIONS - Designed to look and feel like real sheepskin, this beautifully shaped High Pile Faux Sheepskin Rug is a Vegan's best design friend. Soft and luxurious, it's ideal as a cozy bedside rug, yet also looks great on the back of a sofa or accent chair. 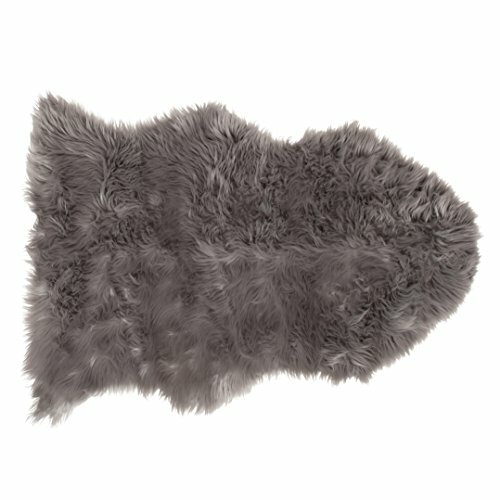 100% ACRYLIC - Super soft and durable, our High Pile Faux Sheepskin Rug is 100% acrylic. The high pile makes it extra cozy to sink your feet into when you step out of a bed in the morning. EASY TO CARE FOR - Simply hand wash cold and lay flat to dry. Expertly crafted to ensure softness and maintain its beauty wash after wash.
SUPREME QUALITY - Designed to provide long lasting beauty, this luxurious faux sheepskin rug is made of quality materials. It is normal for rugs of this nature to shed for a brief period when you first start using it. AVAILABLE IN NEUTRAL COLORS TO SUIT ANY DÉCOR SCHEME - This lovely Rug is available is solid colors of White, Grey, Camel and Black, adding a classic element of style to any space.